No need to overthink this one. 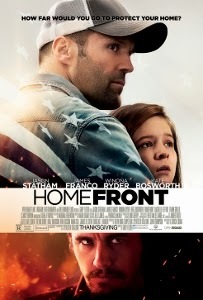 Homefront benefits from the visceral thrill of watching Jason Statham, as former DEA agent Phil Broker, doling out good, old-fashioned, bare-knuckled justice on a bunch of meth cookers. But Homefront’s pleasures go beyond those of a standard-issue Statham actioner. As leader of the meth heads we get a sly, sinister performance from Oscar-nominee James Franco as the memorably-named Gator Bodine. Kate Bosworth tweaks out as his addict sister, Cassie, and Winona Ryder is his whore girlfriend, Sheryl. It was all written by Sylvester Stallone (based on Chuck Logan’s novel of the same name) and efficiently directed by Gary Fleder (Runaway Jury, Kiss the Girls). Set in a Louisiana bayou town, Homefront is low-down, backwoods pulp and Stallone (who also produced) knows how to lay out a blueprint and press the right buttons. Broker is a single dad, laying low with his ten-year-old daughter, Maddy (sensitively played by Izabela Vidovic), after busting a meth-producing biker gang called the Outcasts. The gang’s leader, Danny T (Chuck Zito), lost his son in a hail of police bullets during the bust. All of this will, of course, come back to haunt Broker as he and Maddy tangle with the locals. Maddy decks Cassie’s bully son at school, so Cassie calls in a favor from Gator. She wants her brother to mess with Broker’s mind, neither of them knowing his true background. It all snowballs into something suggesting a bargain-basement version of Straw Dogs, but never less than entertaining. Statham does admirable work as the doting dad who can also bust heads. He and Franco have few scenes together, as Gator prefers to let other do his dirty work. But Franco never goes over the top, effectively conveying Gator’s shifty, cunning (but ultimately misplaced) intelligence. Bosworth seems to have gone full-tilt method for her skeezy portrayal of Cassie – skeletal, dirty, sweaty, she’s startlingly fierce. Of the top-billed cast, only Ryder seems to be stuck without much of character to play, though she gamely adds her fair share of F-bombs (Stallone seems to be shooting for some kind of record here) and generally unsavory behavior. The heart of Homefront remains Broker’s relationship with Maddy, though a perfunctory (and eventually abandoned) romance is thrown in between he and the hottest elementary school psychologist ever, Susan (Rachelle Lefevre). It’s the kind of movie you just might enjoy even more than you expect. Stallone and Fleder deliver exactly what is promised in the trailer: cheap thrills with a touch of sincerity, all made significantly more enjoyable due to the skilled cast.